Opera was imported to Poland by Prince Ladislaus IV Vasa (Wladyslaw IV Waza) a mere twenty years after this art form first appeared in Florence. In 1628 he invited an Italian opera troupe to perform in Warsaw. When he ascended to the Polish throne in 1632, he created a theatre at the Royal Castle and commissioned an Italian troupe under the direction of Marco Scacchi to offer regular operatic performances there. Towards the end of the 17th century, John III Sobieski (Jan III Sobieski) revived presentations of operas. 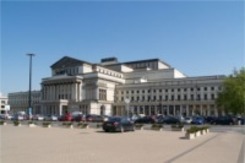 These were subsequently supported by King Augustus II (known as 'The Strong') and King Augustus III, who commissioned the construction in Warsaw of the city's first operatic building, the so-called 'Opernhaus'. Opera, theatre and ballet then truly flourished in Poland during the reign of King Stanislaus Augustus Poniatowski (Stanislaw August Poniatowski – 1764-1795). Beginning in 1774, productions of operas, theatrical plays and ballets were mounted at the Radziwill Palace on Krakowskie Przedmiescie (currently the Presidential Palace). It was there that on 11 July 1778 the first-ever premiere of a Polish opera featuring Polish actors took place. This was a production of Maciej Kamienski's Misery Made Happy, with a libretto by Wojciech Boguslawski based on a comedy by Franciszek Bohomolec. This is considered the moment at which the Polish national opera was born. Between 1779 and 1833 performances were held on Plac Krasinskich (Krasinski Square) in the newly erected theatre that came to be known as the National Theatre. It was on this stage that exceptional actor, singer, director, playwright and entrepreneur Wojciech Boguslawski developed his craft and talents. Boguslawski is now considered the father of the National Theatre. In 1785 the Polish ensemble Tancerze Jego Krolewskiej Mosci (The Dancers of His Royal Highness) initiated its activities here under the guidance of ballet masters Francois Gabriel Le Doux of Paris and Daniel Curz of Venice. This Warsaw-based ballet troupe achieved pan-European renown a short time later. The Grand Theatre has been Poland's representational operatic and ballet stage for over 160 years. This building, constructed in the years 1825-1833 according to a design by Italian architect Antonio Corazzi of Livorno, was intended as the seat of the national opera, ballet, and theatre ensembles already active in Warsaw. The first performance in the newly opened theatre, held on 24 February 1833, was a production of Gioacchino Rossini's The Barber of Seville. The National Theatre was subsequently modified a number of times. While Poland remained partitioned between its three neighboring powers – Russia, Prussia and Austro-Hungary (1795-1918) – the edifice played a significant cultural and political role. It was home to productions of works by Polish composers and choreographers and the site of the world premieres of two exceptional operatic works by Stanislaw Moniuszko: the full version of Halka (1858) and The Haunted Manor (1865). It was also at the National Theatre that Italian choreographer Virgilius Calori first staged the ballet Master Twardowski (1874). Initially according to a musical arrangement by Adolf Sonnenfeld and later by Ludomir Rozycki, this ballet went on to dominate the national ballet repertoire for many years. In addition, the building was home to productions of the operas of Wladyslaw Zelenski, Ignacy Jan Paderewski, Karol Szymanowski and other Polish composers, as well as the ballets of Roman Turczynowicz, Piotr Zajlich, Feliks Parnell and other Polish choreographers. For many years, the Grand Theatre also hosted guest productions of the most important titles from the world opera and ballet repertoires along with the most exceptional Polish and foreign singers and dancers. From 1945 to 1965 the ensemble of the Grand Theatre performed on other stages while the building was rebuilt and expanded after suffering heavy damages of World War II according to a design by Bohdan Pniewski . Reconstruction proceeded under the eye of Arnold Szyfman. A gala concert inaugurating the re-opening of the theatre was held on November 19, 1965. In its new form, the Grand Theatre proved to be one of the most impressive and best-equipped theatres in Europe, and its machines and devices were seen as the peak of innovation in the realm of theatre technology. The National Opera continues to cultivate its legacy of more than 200 years at the Grand Theatre, mounting productions of the works of Polish composers from Karol Kurpinski through Stanislaw Moniuszko to Krzysztof Penderecki. The classical world repertoire is represented at the institution by productions of the most admired operas by such composers as Beethoven, Bellini, Berg, Bizet, Borodin, Czajkowski, Donizetti, Gounod, Massenet, Mozart, Offenbach, Prokofiew, Puccini, Rossini, Richard Strauss, Szostakowicz, Verdi and Wagner (including his famed Ring Cycle). Warsaw's ballet troupe has continued to grow and flourish, working under the eye of such masters as Adret, Alicia Alonso, Béjart, Butler, Cullberg, Grigorowicz, Lacotte, Lazzini, Lifar, van Manen, Massine jr, Méndez, Messerer, Neumeier, Rodrigues, Siergiejew, Walter, Winogradow, and Yuriko as well as many excellent Polish choreographers, from Leon Wojcikowski, Stanislaw Miszczyk and Witold Gruca to Emil Wesolowski.